Hello Everyone! It's Lindsay from the DT, back again to share a fun and easy stamping technique with you! Today, I have a video tutorial on Mirror Stamping. There have been quite a few tutorials on this technique, and I tried them, but I had one problem. I could not pull my stamp straight up from the acetate. There would always be smearing or double lines (sometimes triple) and after about my 15th attempt I knew I needed to find another way, so I pulled out my stamp positioner. Watch the video tutorial below to see exactly how I used my stamp positioner and the Mirror Stamping Technique to create this super fun card! 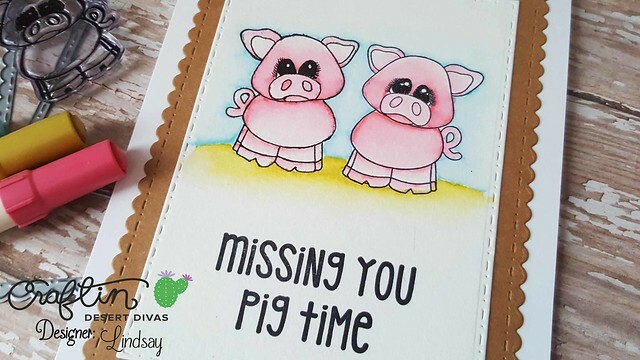 Using the little pig from the CDD Farm Living Stamp Set, My MISTI (Any Stamp Positioner will work here), a large piece of watercolor paper and waterproof black dye ink I first stamped the pig exactly how it should appear. I made sure to stamp in the center of the paper so I could go back and die cut later without worrying about placement, which is also why I used such a large piece of watercolor paper. With my first pig stamped I cleaned off the stamp and removed the watercolor paper from my MISTI and inserted a piece of acetate. 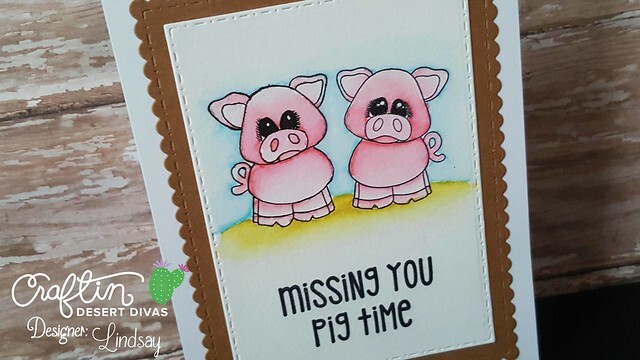 I placed the pig stamp onto my watercolor paper with the side that is intended to be mounted onto acrylic blocks down onto the paper and then flipped the paper over, lining up the corner in the MISTI, placed my pig onto the acetate and then picked up the stamp onto the lid of my MISTI. After inking up and stamping the stamp a few times onto the acetate I used my MISTI again, placing the watercolor paper into the corner of the MISTI and then flipped the acetate over onto the paper, ink side down and lining up the corners in my MISTI and gave it a good press to transfer the image onto the paper, giving me a mirror image. This mirror image is going to be a pretty light stamping so you do need to outline it with a pen. I used my micron pen because it is waterproof and I knew I would be using watercolors to color in my image. Just make sure to use a pen that plays nicely with your coloring medium and take your time. Next, I die cut my two pigs with the largest stitched rectangle die in the Fancy Frames Die Set, making sure to center the images in the die. To color my little scene I used Distress Markers and the straight to paper watercolor technique, using a light touch to give a soft effect. 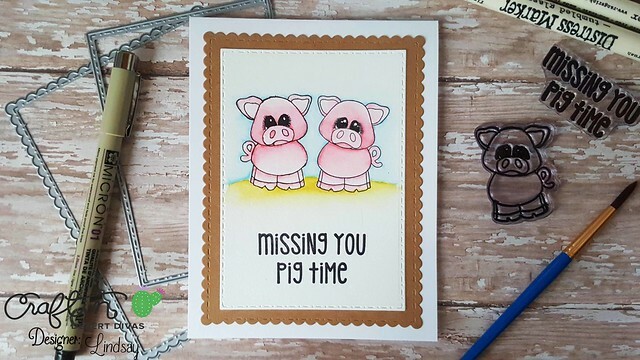 Before I put my card together I stamped the "Missing You Pig Time" sentiment in the stamp set directly below the scene. Again, I used my MISTI so I wouldn't mess up my panel after all the work put into it! Then, I adhered the water color panel onto a kraft scalloped rectangle die cut, again from the Fancy Frames Die set, using double sided adhesive. Finally, I adhered the stacked panels onto an A2 top folding white card base with double sided adhesive. You could always use some fun foam or foam tape to add some dimension, but I wanted to keep this particular card nice and flat for easy hiding in luggage! This technique is a great one to use for any card with a cute critter, but I can see it being especially useful for upcoming Valentine's Day cards! I found using a stamp positioner was really helpful, but remember, you don't necessarily need one to make this technique work, just be sure you have a pretty steady hand! If you want to check out the CDD products I used today, they're all linked below! I'll see you all next time!! Thanks for the tutorial, Lyndsay! Very cool! Amazing card, Lyndsay! I would suggest to try mirror stamping with Versafine ink since it's very crisp and stay wet longer that other inks! Thank you SO MUCH for sharing this technique for mirror stamping!!!! I also have left hand tremors due to my MS. This is one technique that I can't wait to try!! Thank you VERY much for sharing this!!! I am so glad you found it helpful!!! Thanks so much!! !